Mari Hannah was born in London and moved north as a child. Sponsored by the Home Office, she graduated from Teesside University before becoming a Probation Officer, a career cut short when she was injured while on duty. Thereafter, she spent several years working as a film/television scriptwriter. During that time she created and developed a number of projects, most notably a feature film and the pilot episode of a crime series for television based on the characters in her book, the latter as part of a BBC drama development scheme. She lives in Northumberland with her partner, an ex-murder detective. 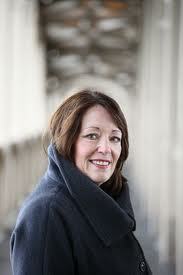 In 2010, she won the Northern Writers’ Award. The Murder Wall is her debut novel. You can read my review here and order a copy here. Those who follow me on Twitter (@mariwriter) will already know how I feel about Theakstons Old Peculier Crime Writing Festival and how inextricably linked it is to my journey to publication. Well, it’s nearly that time of the year again. The excitement is building and crime writers and readers from all over the world are about to descend on Harrogate for the tenth time. This year, I have more reason than ever to be excited . . . Being invited to take part in the Creative Thursday programme is a dream come true. I’ll be joining fellow authors Mark Edwards and Louise Voss, their Harper Collins editor, Kate Bradley, and my own, Wayne Brookes of Pan Macmillan on a discussion panel entitled The Road to Publication: Success Stories. The idea is to highlight and explore different routes to publication. It is both an honour and a celebration for me to do this in Harrogate where my story began. The one thing Mark, Louise and I have in common is that our journeys were long and difficult. But long and difficult does not equal impossible and that is the message I’ll be trying to get across. Creative Thursday is a great place to start. It’s a day of writer-led seminars and workshops, a chance to rub shoulders with those who have thrilled us with crime fiction for years. I’ve said before, the festival is what you make it. Either you engage with others or you stand on the sidelines and miss the opportunity. I attended my first festival on the advice of NJ Cooper – Hooray! She’s just been longlisted for the CWA Gold Dagger for Vengeance in Mind . We’d met at the Hexham Book Festival. The following year, I arrived in Harrogate a bit nervous, alone, and knowing very little about the industry I wanted to be part of. Big mistake when you’re suddenly in a room full of book enthusiasts, authors, agents, publishers and bloggers. 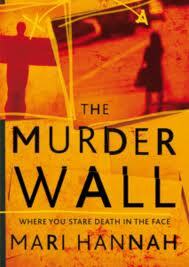 The important thing is that Creative Thursday gave me the impetus to finish my debut, The Murder Wall. 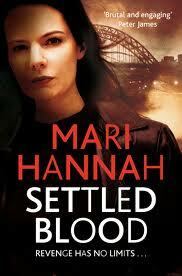 In 2010, I won a Northern Writers’ Award for Settled Blood, the second in the Kate Daniels series. This was after translation rights had been sold to Goldmann in Germany for the debut, but before my agent had found a UK publisher. Then came my big break – a three book deal with Pan Macmillan. There have been many proud moments this year. A quote for The Murder Wall by Peter James: Brutal and engaging, Mari Hannah writes with a sharp eye and a dark heart. A glowing review from Marcel Berlins (Times) and another from Laura Wilson (Guardian) both had me shrieking with delight! I thought I might die of excitement. I’m only now getting used to the public side of being a professional crime writer. Oh yes, there is a whole other aspect to the job! Since The Murder Wall was published on 12th April 2012, I’ve been fully engaged with the reading public: signing books, giving interviews, facing a barrage of question about why I write, what kind of stories interest me, how many hours a day I devote to the craft of writing, how I plan and structure my novels. In May, I had my first taste of speaking at Crimefest – another great festival held in Bristol. And last month, I took part in Crime on Tour when Theakstons Crime Writing Festival took to the road bringing ‘New Blood’ to crime fiction fans ahead of the festival itself to mark their tenth anniversary. Just about every week from now until Christmas (don’t ask me when I will ever find the time to write) I’m appearing somewhere or other – and that’s not including the launch of Settled Blood in November. There are few who relish taking the stage or being held up as an expert and I’m no different in this respect. I’m not a shy person but neither do public appearances come naturally to me. However, as my confidence has grown, I’ve come to realise how important it is to take part in such events. It’s an opportunity to thank the reading public for their support, to pass on what I’ve learned along the way, and to contribute something new to the genre of crime fiction. I’m no longer the person standing on the outside looking in. I’m a fully paid up member of the crime writing community and it’s a great place to be. Theakstons Old Peculier Crime Writing Festival has played a huge role in getting me there. I hope some of you will join me at Creative Thursday when I have the chance to give something back. And you can keep up with Mari and her books at her website here. I won’t be there for Creative Thursday (but will be there from Thursday afternoon onwards), but I’m hoping to make The Murder Wall one of the books I pick up while I’m in Harrogate!